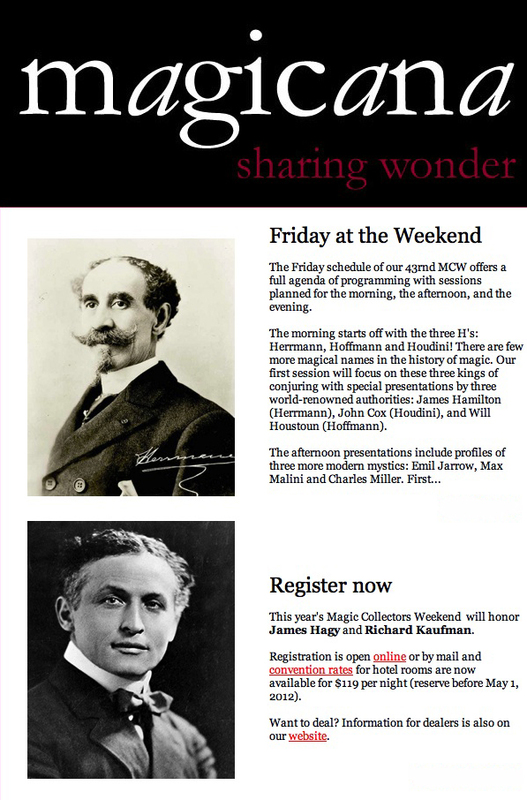 The 43rd Magic Collectors Weekend is set for May 10-12 in Chicago, and today the MCA revealed their program line-up for Friday morning. Now, exactly what I will be presenting is top, TOP!, secret, but I will say that I'm very excited and honored to have been chosen to present something that I think will blow people away. Click here for information on how to register for the weekend. And keep watching the MCA's Mystery & History blog for more program announcements...maybe even some more Houdini. Well you beat me to posting this! I saw it earlier and wanted to put it up on my blog first, too slow on my part. Good luck on the lecture! I know it will be incredible!